Maurizio Craviotto is head of the refit division at the Baglietto shipyard in La Spezia and the third generation of his family to work for the flying seagull brand, continuing a proud tradition that began with his grandfather. Repair, maintenance and warranty work is a vital ingredient of any modern shipyard and a service that Baglietto takes very seriously. Can you describe your background in the marine industry? 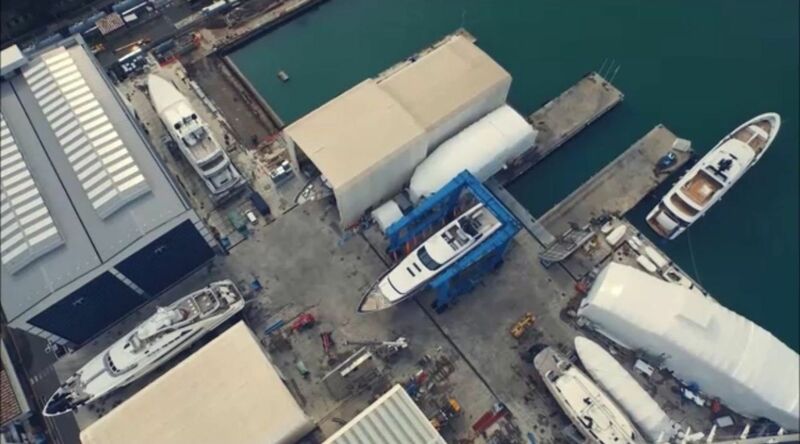 I’m from Varazze, the original home of Baglietto, and have worked in the boat business for over 30 years, first in the commercial and cruise ship sector and then in the fast ferry market specialising in hydraulic systems. When I joined Baglietto in 2005, I was following in the footsteps of my grandfather, who was hired by Pietro Baglietto, and my father who worked at the Varazze shipyard for 46 years until 1982. But I also had a cousin and an uncle who worked at the yard, so you could say that Baglietto is in my blood and I remember my father taking me along on sea trails as a young boy. How has the refit department developed in your time with the company? Refitting took off when the new marina was built in Varazze, which created a market for repair and maintenance work alongside the new builds. 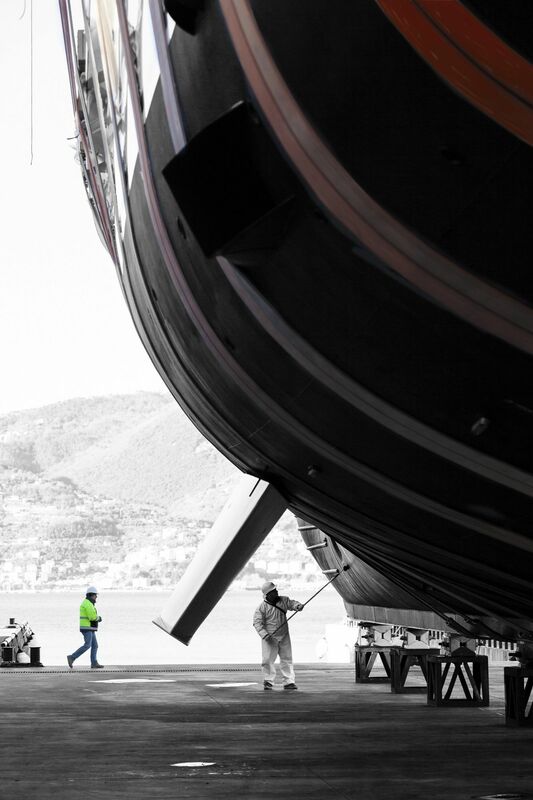 As with any shipyard, refitting can fill in the gaps between new orders, and helps to maintain contact with key suppliers and subcontractors, which became particularly important following the economic downturn in 2008. When Baglietto closed down under the old management in 2010, I continued the refit work in Varazze for two years. We worked on all sorts of boats – sail and motor, steel and aluminium, and even wood. I remember, for example, refitting one of the three 24m Maiorca classic cruisers built by Baglietto. The mahogany hull had been poorly repaired at another yard and we had to strip her back down to bare wood. Then operations were relocated to La Spezia? After the Gavio Group acquired the brand in 2012, Diego Deprati, then Baglietto CEO [now CEO of CCN], came to visit me in Varazze where we still had a lot of equipment, inventory records, and the 44m hull that eventually became Monokini. He asked me if I’d be willing to head up the refit division at the new facility in La Spezia, and I agreed. The current management is fully aware of how important an effective warranty and repair service is to owners, who simply don’t want issues during the couple of weeks they spend on board in the summer. How is the infrastructure in La Spezia set up for refit work? We have six covered new-build sheds and new concrete foundations outside, where most of the refit work takes place. 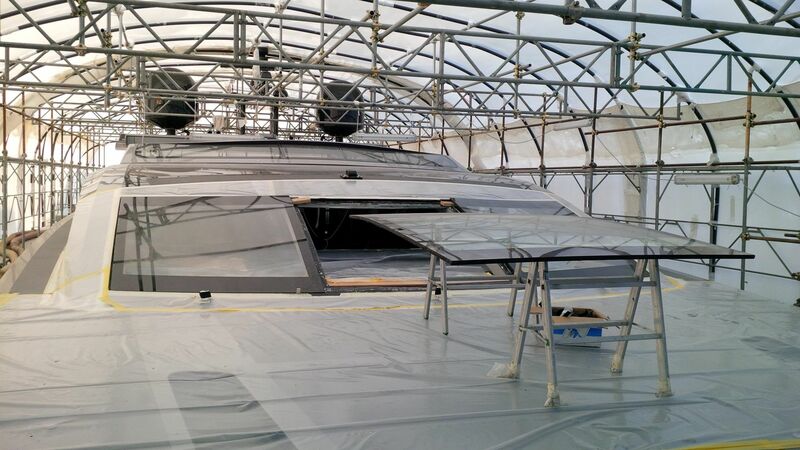 If it’s a job that has to be done under cover and the sheds are full, we erect inflatable cocoons around the yachts to protect them. Over the course of the year we will have a dozen or so refit projects, ranging from cosmetic upgrades to full mechanical repairs. In addition, we will travel abroad to solve an owner’s problem and decide whether to carry out the work in situ, or bring the boat back to the yard. What have been some of your most recent refit projects? One of the biggest was a couple of years ago when we substituted the engines aboard Monokini for new MTUs. Then last year we refitted Nina J, which included replacing all the teak decking and the exterior glass windows, and a full repaint in the same colour as the owner’s fleet of corporate jets. As we speak, 52m Blanca, 46m MR T, and 46m Unicorn are all in the yard. Refitting is challenging work because you never know what you might find, especially if it’s not a Baglietto and we have to track down the original plans and materials. But the fact that it tends to be more complex than building new makes it all the more rewarding!